The number of people homeless and living in emergency accommodation across the State has reached a record high and now stands just below 10,000. Latest figures from the Department of Housing show that in January, there were 9,987 adults and children without a home and staying in hotels and family hubs. Compared to December, there was an increase of 234 homeless people in emergency accommodation last month. The figures show the number of children in emergency accommodation now stands at 3,624, an increase of 65 on December. The number of families homeless decreased by three to 1,614. 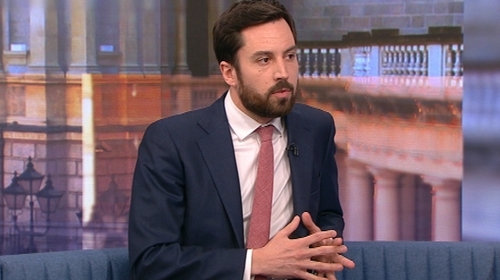 Minister for Housing Eoghan Murphy said it is very disappointing that homelessness is heavily impacting on people's lives. He said there was a decrease of people in emergency accommodation in December, and a rise in January was anticipated but said that does not mean it is acceptable. The minister said for the second consecutive month, the number of families exiting emergency accommodation into a tenancy in Dublin exceeded the number of families entering homelessness. According to the department, 96 families were prevented from becoming homeless in January. Sinn Fein's Eoin Ó Broin has said that Minister Murphy "must resign" on foot of the latest figures. Mr Ó Broin said with the figures revealing a "new high", Mr Murphy had no other option but to stand down. Responding to today’s figures, Merchants Quay Ireland, the national homeless and addiction charity, said that the latest homeless statistics represent an ongoing national trauma. CEO of Merchants Quay Ireland Paula Byrne said: "The latest homeless statistics show that Ireland is experiencing its biggest social crisis in generations." Labour Housing Spokesperson Jan O'Sullivan said the figures were another reminder of how unfit for purpose Rebuilding Ireland has become. She said the 234 additional people in homelessness in the month of January was unacceptable. Deputy O’Sullivan said: "The most effective action the Minister can take is to prevent people from becoming homeless in the first place and the most effective way to do that is to stop eviction notices and rent hikes in the private sector. We know that most of the people who become homeless have been renting in the private market." Focus Ireland said the homeless figures in January show the Government is still failing to do enough to ease the crisis. The charity said Government policy must make a greater shift away from delivering extra homeless emergency accommodation towards delivering a lot more social housing. Solidarity TD Mick Barry said any government which allows homelessness to touch the 10,000 mark does not deserve to remain in power. He said the latest figures demonstrated the "shocking failure" of the market to deliver affordable, secure housing.